Embedded and mobile phone software development. 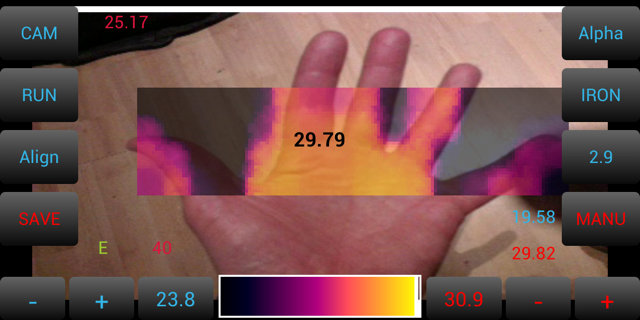 Android App for displaying thermal images on your smart phone. - The thermal data can be shown as an overlay on your camera picture. - You can take a screen shot of the display with the thermal data on top of the camera picture. - Select different palettes, 6 in total. - Change the transparency of the thermal data. - Align the sensor data with the camera picture. - Re-size the camera picture for better alignment with the sensor data (settings menu). - Change sensor orientation (settings menu). - Pause the on screen data for easy adjustment and fine tuning. - On screen minimum and maximum temperatures. - 3 Auto scale functions. - 1 Manual scale function. - Celsius or Fahrenheit (settings menu). Communication with the hardware is done by Bluetooth SSP. If you want the app to support other or your sensor hardware please contact me.